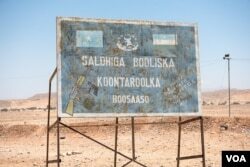 A checkpoint in the desert of northern Somalia is the first line of defense against Al-Shabab and Islamic State from reaching the port city of Bossaso, the economic hub of the semi-autonomous Puntland state. The two extremist groups have set up camp in the mountains east and west of the city, and launch periodic attacks, including two assaults on the checkpoint last year. In daylight, armed police search every car heading in and out of the city, looking for weapons, explosives, and hidden militants. At dusk, they take up positions behind bunkers in case the extremists attack again. "We are always on standby, we are always careful, but with God's will we will defeat them one day," says Lieutenant Colonel Mahmoud Mohamed Ahmed, who commands the checkpoint. Puntland has long been more stable than the country's volatile south, where al-Shabab has battled the government and African Union forces for the past decade. But in the past year, there have been a string of smaller attacks in Puntland, including tossed grenades and shootings in and around Bossaso. 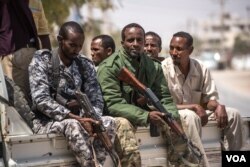 Now, government security forces are on alert amid fears that Somalia's instability may be creeping north. At the checkpoint, Ahmed says they uncover weaponry or make arrests almost every day. Two weeks ago, they found six al-Shabab suspects hidden in a truck bed, he says. Just days before VOA's visit, Ahmed says his men captured a suspected IS member who had jumped off his vehicle and tried to skirt the checkpoint by foot. "I sent two groups of troops. Some took the vehicle, the others went by foot," Ahmed explains. "When [the suspect] saw the first troops coming in front, he tried to run backwards, and he ran into the second group." In Bossaso itself, security appears tight, with police and soldiers riding pickup trucks, maintaining a visible presence on the streets. But authorities admit extremist cells are in the town, blending into the civilian population. There have been two attacks on police posts in Bossaso this year, killing a handful of officers. 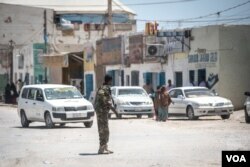 "As a normal person you can’t distinguish them from the rest of the people, and if they have the intention to do something, they do it and run away," says Colonel Abdul Hakim Yusuf Hussein, the police commissioner for Puntland's Bari region, which includes Bossaso. While it's unclear exactly who carried out the two recent incidents, police have set up new checkpoints and conduct night operations in the city to round up potential troublemakers. Hussein says al-Shabab members are shifting north to escape military pressure in southern Somalia, and gain access to weapons smuggled by sea across the Gulf of Aden from war-torn Yemen. But Hussein downplayed the overall extremist threat, noting that IS, which briefly captured a town east of Bossaso in 2016, now only has between 40 and 50 fighters, not enough to launch large offensives. He said smaller grenade or gun attacks are merely a way for extremists to say "We are still here." 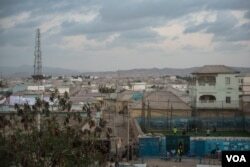 Bossaso remains calmer than Somalia's capital Mogadishu in the south, where deadly explosions are common. 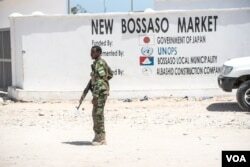 Attacks in Bossaso target security forces and officials, a contrast to large bombings in Mogadishu that mostly kill civilians. During a walk with police through a busy market, VOA spoke to shopkeepers like Ali Mahmoud, who said security was fine in the city. “You can come across an accident or an incident, but there is no big threat that we now fear," he said. Even so, as long as extremists remain in the countryside with access to weapons, Bossaso is not completely safe.